Q. How long will it take to dry? A. Approximately 1 to 2 hours depending on weather conditions and the condition of the carpet. Q. Who will clean my carpets? Company policy is to try and follow up with a phone call to the customer on how the job turned out after 30 days of the cleaning; which the customer is told about at the end of the job. I will leave up to three messages on the customers phone, If a customer does not respond after three attempts, we leave a message that we assume the job turned out fine and that the customer is to call us regarding any concerns. There is no charge to the customer to come back out and try to fix any issues they may have from the original cleaning. Note: Carpet and Upholstery cleans only as well as its age, how it has been cleaned before, and the condition of the Protector in the Carpet and Upholstery before we clean it. This is discussed with the customer when they book an appointment and also looked at once we arrive for the job. We are a Family Owned and Operated Carpet Cleaning Business that is building a reputation, one satisfied customer at a time. Deep Carpet Cleaning with Circular Dry Foam Rated Superior by Consumer Report, Over Steam Cleaning, Chemical Dry or Shampoo Methods. 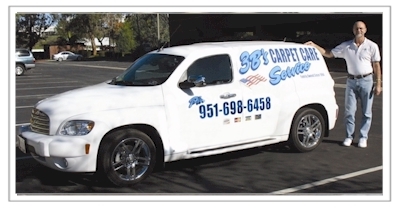 If you need to have your carpeting, flooring, or upholstery cleaned by the best company in the Temecula Valley that I know of, call John of 3B's Carpet and Floor Care Service. I have used his services for 15 years and I highly recommend him for all of his cleaning services. John is very conscientious and thorough in all of the work he performs. John also freely shares his cleaning maintenance tips whenever. I call him for advice. I have had wine stains which he has been able to get out; which I never thought would have come out. He has numerous products for red and brown stain removal. He is very accommodating when setting up your cleaning appointment and also uses the best quality products and stands behinds his work. Also, when I needed to replace my vacuum, he was able to recommend a high quality vacuum that I have been very happy with and keeps my carpet cleaner and I have less wear on the carpets.